The cup holder is great. Easy to install and fits most cups. The window covers are super easy to apply but they don't really block much sun and relatively small compared to most windows. This was a nice addition with the car seat, the window clings are nice, just stick on, easy to adjust! 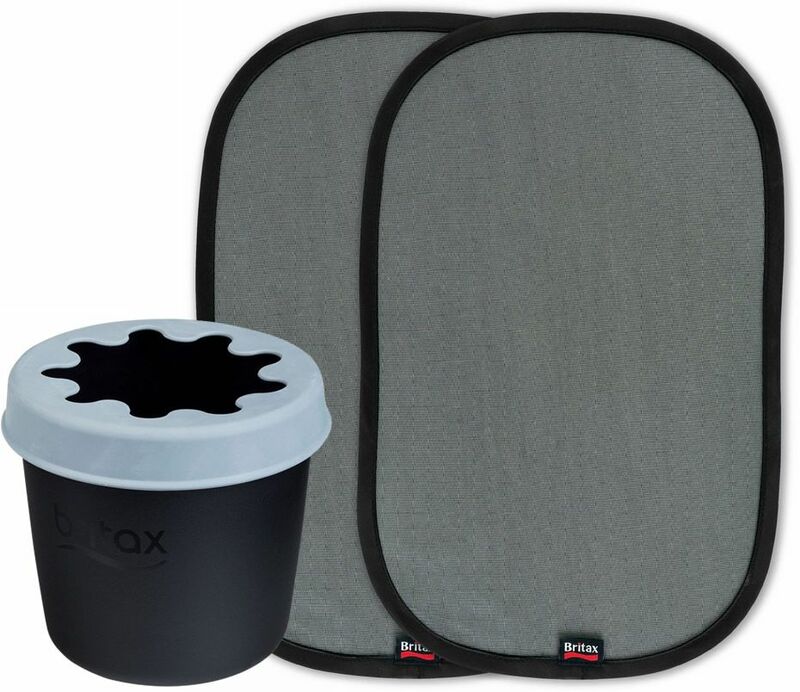 Cupholder fits fantastic on both our Britax Boulevard and Marathon car seats. Easily interchangeable. The window shades don't work as nice as the Brica roll-down ones you can buy because they just don't stick to the windows that well. I'm constantly having to restick them after they fall off. 5 stars for the cupholder and 2-3 stars for the window shades. The sunshade is great! Just pop it out of the bag, and stick it on your window. The cup holder, though, is a pain in the neck to put together. You have to attach the cup to the bracket, and it was NOT easy to do. The upside, I guess, is that it won't easily come off! What a great add on to the car seat! Very useful and appreciated- keeps the bright light out of the baby's eyes and holds the sippy cup or bottle nicely!! Great product, best price, and very fast shipping. I had them two days after ordering. Great bundle! Very nice sun shade but cup holder is just OK.
Love the sun shades. No stupid suction thingy that typically use for holding the shade onto window. This one just using similar plastic like food wrap material to stick onto the window. You could remove easily and stick back on with ease. The best design of sun shades I've ever seen. The cup holder on the other hand... just OK. When attached to seat, sticks out too much. I had my car seat on right side of back seat. If I put the holder on right side of the car seat, I cannot close the door because it just sticking out. I have to attach it on the left side of the car seat, but then it makes the middle seat of the back row seat unusable because it was sticking out. The rubbery thing on the holder to prevent cup also not very fond of them. Making it tooooo hard to take out cup and put it back in. Without it, the cup will wobble in the holder. I would give rating 1 for the cup holder but rating 5 on shades.